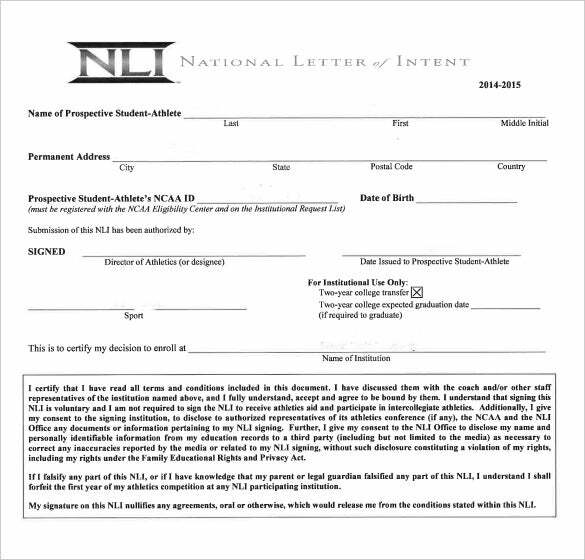 National Letter of Intent – 9+ Free Word, PDF Format Download! You may reckon that letter of intent is commonly used in business environments. Well, that is untrue. Schools colleges and universities also issue letter of intent. Take this sample for instance. It is a national letter of intent specifying that a student-athlete is participating in in NCAA (National Collegiate Athletic Association) colleges & universities across the States. You can also see free letter of intents. 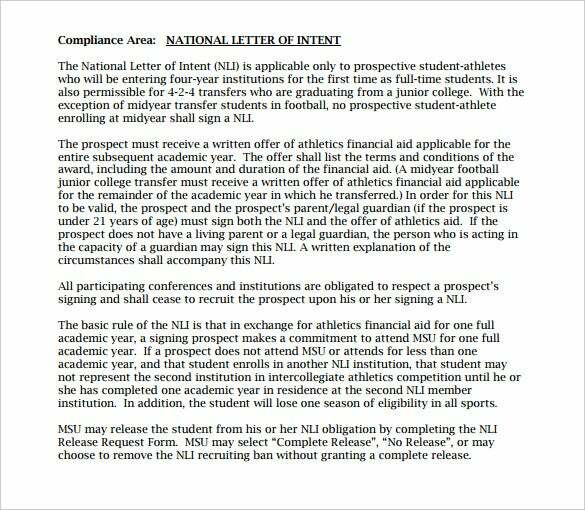 The national letter of intent Word documents the declaration by the student regarding his intention to join NCAA institutions. 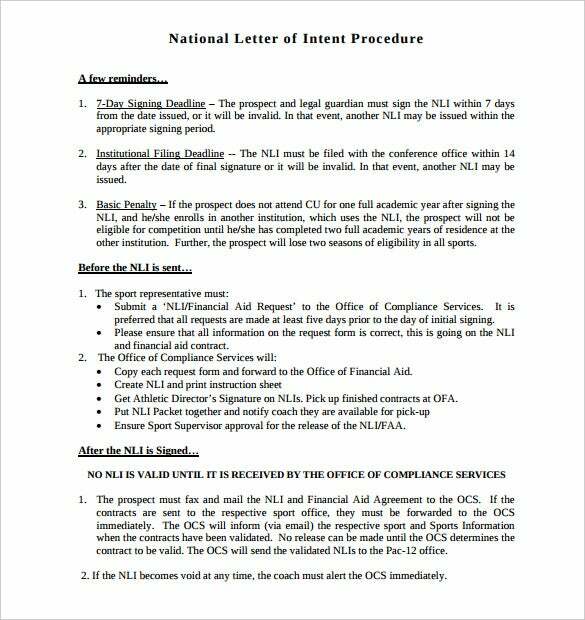 It’s always an elaborate document and if you need ideas on how to draft a proper NLI, the best thing is to go for a readymade National Letter of Intent template. hamptonroadssports.org – A good number of students usually express interest for participating in the NCCA. In order to confirm their candidature in the NCCA, letters have to be written for the same. This template shown here is in MS Word format. This example displays a letter required by a football player so as to participate in a NCCA-organized football game. 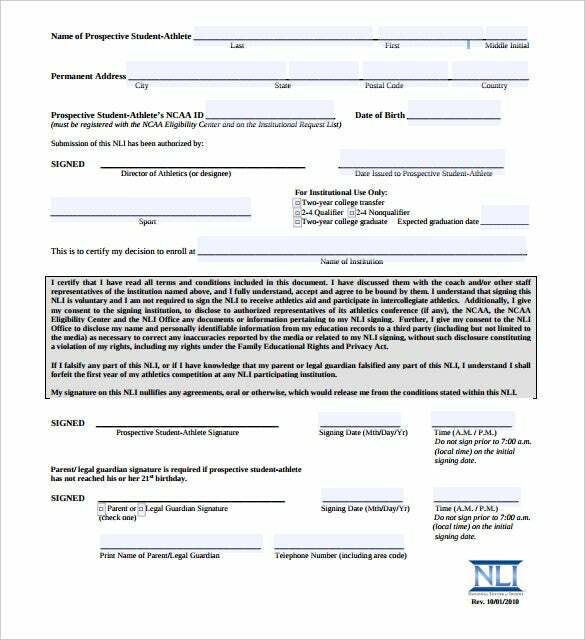 athleticscholarships.net – This letter is written to show eligibility of a person to attend the national collegiate athletic association. 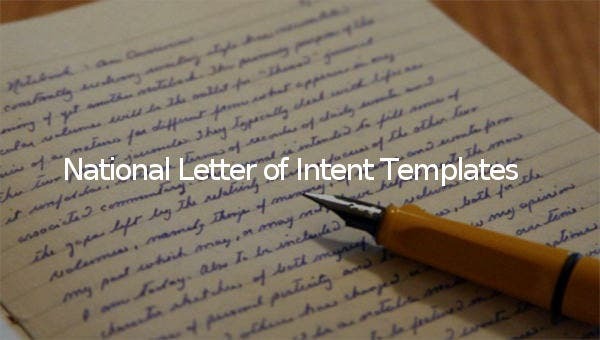 This Word template is what you need to write a complete convincing letter of eligibility. baseballcoaches.org – For students looking to attend the ncca and play football this is the file you need. This PDF file contains the letter, which is readily printable, that you need to attend the games. ursuline.org – This is a letter that shows the signing of the collegiate athletic commitments. 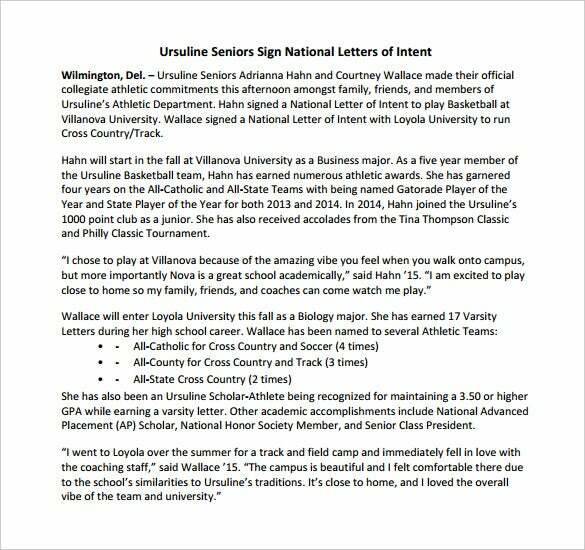 Ursuline senior signed to play basketball at villanova university. This PDF template is for people who want to know the details of the signing. 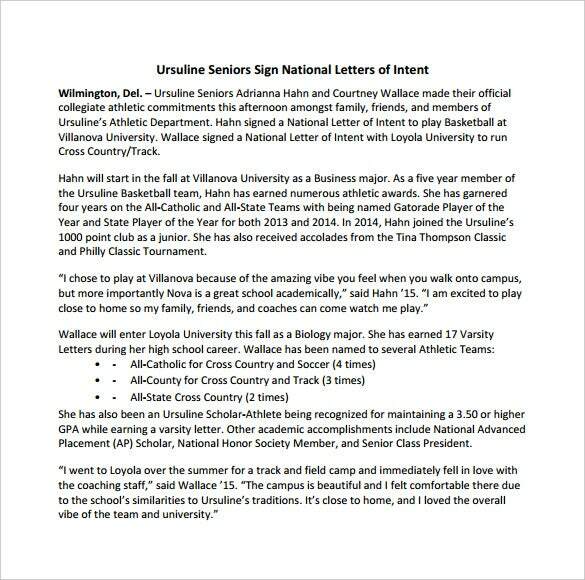 bville.org – This PDF letter template also talks about the signing of ursuline and courtney Wallace of their official collegiate athletic commitments. The signing takes place in the presence of friends and family. 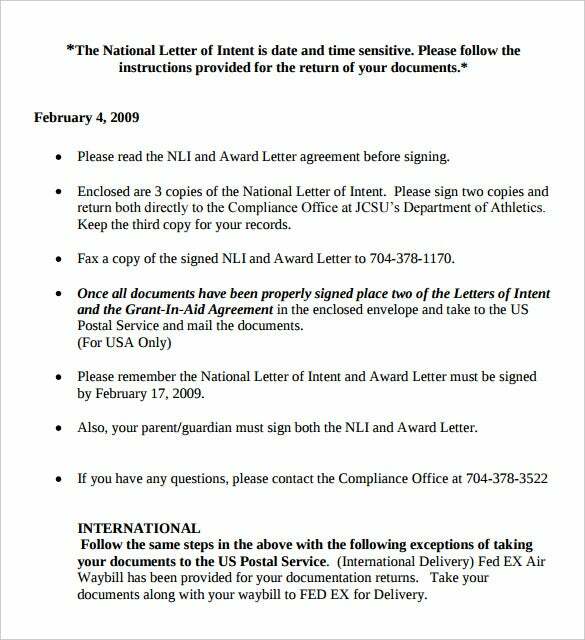 goldenbullsports.com – This letter is for the people looking for the instructions of the national letter of intent. This readily printable PDF template outlines the instructions. The letter is date and time sensitive. pesc.org – This letter is for people who want to address their issues. This file in PDF format contains the letter needed to forward your complaints. It is convenient for downloading. bsubeavers.com – This file contains a letter that has questions and answers of the letter of national intent. This is file in PDF format. The file is convenient for the people who want to know about the questionnaire. 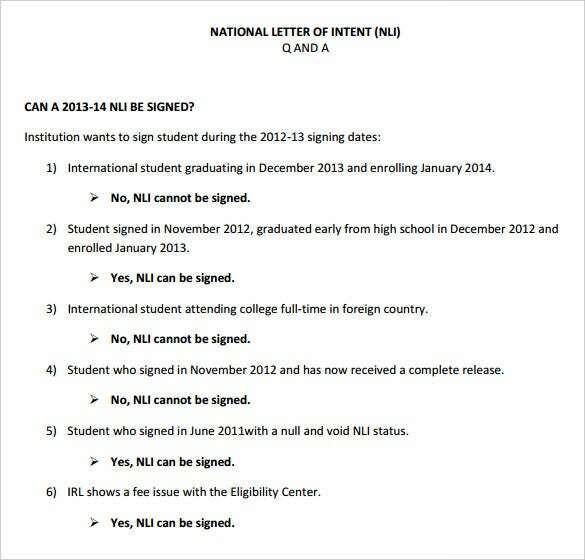 msu.edu – This file is for people who are looking to know the university compliance for the letter of national intent. 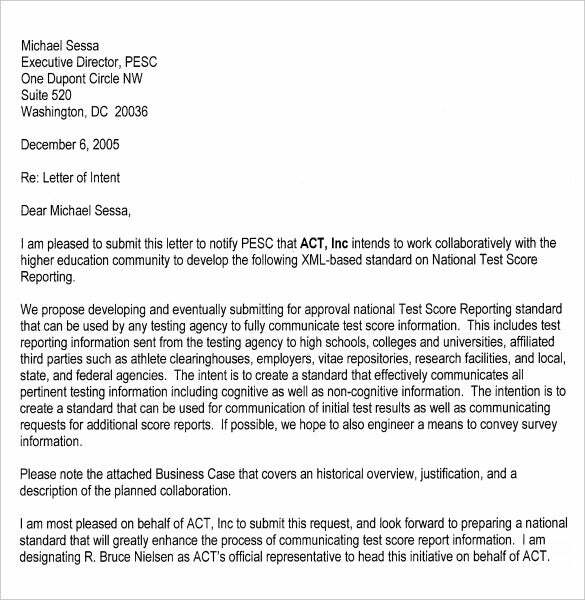 The PDF letter template consists of the requirement of the athlete to participate in the ncca. 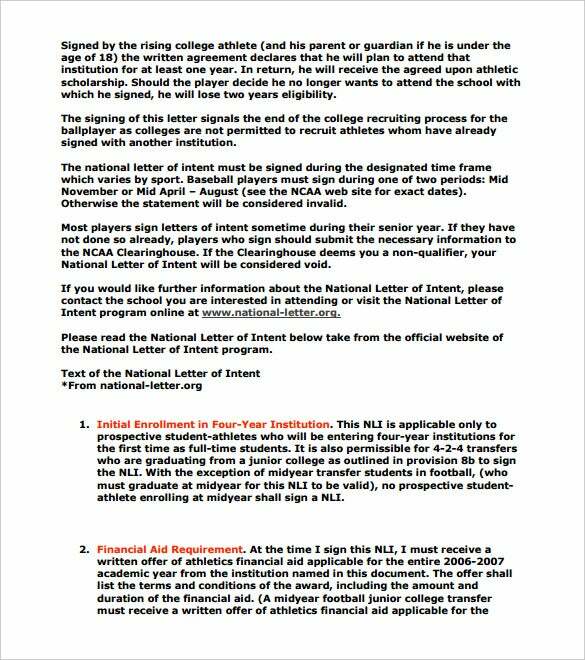 cubuffs.com – This file contains a letter that shows the procedures of the national letter of intent. The PDF letter template is readily printable to any one in need of it. It gives the procedure from before the national letter of intent to after the letter.